Just 20 mm thick at its thinnest point, decoratively ribbed and not even half as heavy as a conventional concrete ceiling: with “Smart Slab”, the name says it all. 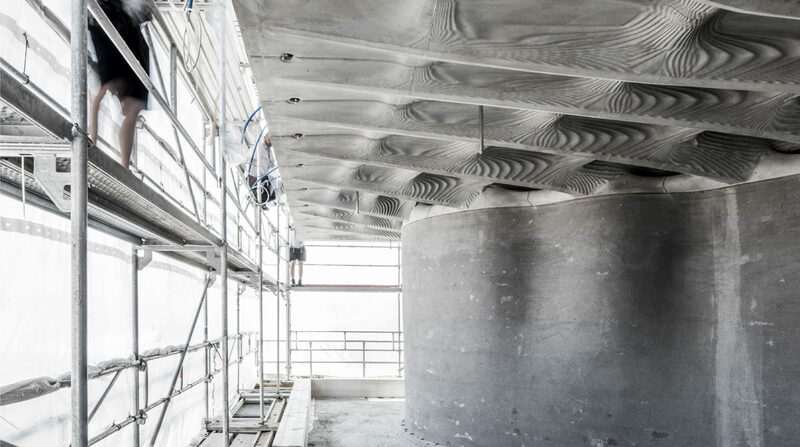 The slab combines the structural strength of concrete with the design freedom of 3D printing. Developed by the research group of Benjamin Dillenburger, Assistant Professor for Digital Building Technologies at ETH Zurich, Smart Slab is one of the core elements of DFAB HOUSE. The 80 m2, 15 tonne ceiling consists of eleven concrete segments and connects the lower floor with the two-storey timber volume above. Dillenburger’s research group developed a new software to fabricate the formwork elements, which is able to record and coordinate all parameters relevant to production. After planning on the computer is completed, the fabrication data can then be exported to the machines at the push of a button. This is where several industry partners came into play for Smart Slab: one produced the high-resolution, 3D-printed sand formworks, which were divided into pallet-sized sections for printing and transport reasons, while another fabricated the timber formwork by means of CNC laser cutting. The latter gives shape to the upper part of the Smart Slab and leaves hollow areas that reduce material and weight and at the same time create space for electrical cables. The two types of formwork for the concreting were then brought together by a third company, which first sprayed the fibre-reinforced concrete onto the sand formwork to produce the finely ribbed surface of the lower concrete shell and then casted the remaining concrete into the timber formwork. After a two-week hardening process, the 11 individual concrete segments were ready for transport to the NEST. Thanks to the precise planning and prefabrication, the installation time at the construction site was reduced to a minimum: a crane hoisted the concrete elements onto the load-bearing wall, where the prestressing took place. Detailed information about the building process and the advantages of this novel construction method, quotes from the project leads and additional images can be found in the online news by ETH Zurich.